As Christmas draws near and the end of 2014 I thought it was time I updated everyone about the work that has been being done this year. After returning from my last trip in November 13 things got pretty hard. Funding became difficult to obtain and I really felt I did not know where Hi-Cap UK should be going. But one thing was sure in my head I was not going to GIVE UP! So I thought about the best was forward for Hi-Cap to move. As we have 106 children to support how was it going to happen with funding being so tight. Then came the ultimate idea to obtain Personal Sponsors for all 106 children. so I began this project. No we have not managed to complete the 106 yet but we are making progress. 13 children now have personal sponsors, thus we manage funding for the rest. Personal Sponsorship is very important, as all sponsors are told that this is for the school life of the child. I would not want a sponsor to pull out, so therefore £10 minimum a child is very affordable and hopefully my sponsors will never give up supporting their child. I have made this very clear. On our recent trip to all of the 5 schools that we support we told the children about their sponsors, giving each of them a picture of the person or persons and details of who they were, and they were overwhelmed, once we have explained what a sponsor meant. 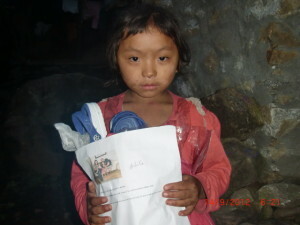 Below see Ashika receiving her first letter from her sponsor with items that we purchased with the money that was in her account. What we do with the sponsorship payment. Each child has its own account and the money is allocated to them on each of our visits. We investigate what they need and make sure they get it. Out of every £10 we put £1.50 to one site for the visit costs. Here Ashika was given a warm coat, good sandals and a woolly hat. We are due for another visit very soon and our Personally sponsored children will receive further very needed items. All sponsors are given feedback about their child and are welcome to write and send parcels if they would like. The idea is that the sponsor will build up a relationship with the child and feel real pleasure as they see the child grow and thrive. Following this new project I have been trying to get financial support to build a hostel to support a school in the village of Simpani. After 2 years of trying and sending information to FFK we have finally got the funding. I am overwhelmed with the support of Future For Kids in believing in us enough to give us the funding for this wonderful project. The project will be commenced in 2015 the planning is now being made. It will be Hi-Cap UK’s biggest project and I am so pleased to be given the pleasure of letting these people know that we can make this dream for them happen. 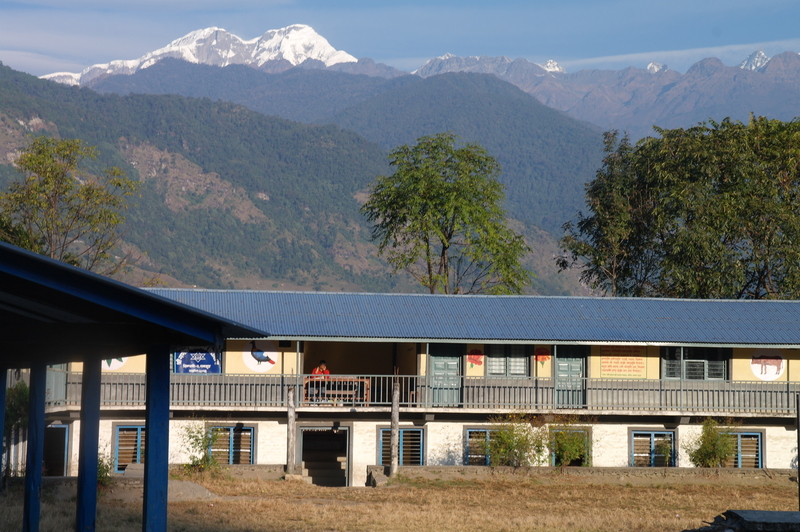 The school sits in a very remote area (see below) many children trek for 2-3 hours everyday to get to school and again to get home, the Hostel will house them over night, improving their education and health. There are still many children that need sponsorship. We manage to provide uniform and stationery for the remaining children and try very hard to give some support to the schools. But it is very hard to keep going. But we have not have a bad year we have had great support from our trustees. But we would like to have more of them, if you are interested in becoming a trustees of Hi-Cap UK please let me know. Areas like the Himalaya’s get forgotten but is a most remarkable and beautiful area, but it needs some help. So 2014 did improve much to my joy and thankfulness. It is very hard to get funding but where there is a will there is a way. Hi-Cap UK , myself, I will never give up. The pleasure of making a difference in this area is overwhelming and nothing on this earth could replace that pleasure. It is all about giving these children a chance, and lifting them up, a chance that they may not have had without Hi-Cap. With warmest wishes to you all and if you are interested in any of our work, or would like more information please contact me through the website or my email hicapuk@btinternet.com or call 07968524379 to speak to me direct.